This book started off great! It started really interesting because it posed lots of questions that none of the characters considered "questions." Why is there a wall around our village that we can't cross? Why do 18-year-old boys disappear? The characters ask these questions, then shrug and move on. What I initially loved about this story was that it actually GAVE US ANSWERS! I get so tired of books that string you a long with question after question and just expect you to keep reading even though you're NEVER given ANY answers! Not with TAKEN. Not long after questions were asked, they were answered. And then more questions were asked an answered. And then... we started getting answers to questions we hadn't asked... And by the end I found myself wishing that the author had held SOMETHING back. Because now that I've finished it, all my questions have been answered, and the only thing that might motivate me to read the second book is the love triangle. But here's the thing about the love triangle. It's an interesting one (since it's two girls and one boy), but I never really connected with either of the girls. Perhaps it's because I read the book too fast, or perhaps it's because the book was full of "one week later"s and "two months later"s. I'm not a huge fan of books that skip so far forward in time. I want to SEE what happens there! Put your big breaks in between books! But even though I've listed what I think are the books 2 faults (answers too many questions and goes too fast), it has many more virtues. I love the story, I love the setting, I love the premise, I love the main character (Bowman does a GREAT job writing from a male perspective [said a female]). And I certainly will read the second book. But am I dying to get my hands on it? No. The ending to this one left me perfectly content. Hopefully that doesn't mean that it also made this book perfectly forgettable. EDIT: I initially wrote this review on April 24th. About a week ago I was trying to decide what to read and I saw this on my shelf and thought "Oh yeah! 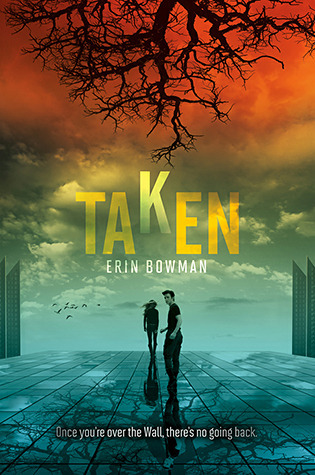 I really want to read Taken! Why haven't I read that yet?" I even picked it up and put it in my purse before I realized "Wait... I have read that." So, forgettable? Apparently. Hmmmm I haven't read this one, so I can't compare my thoughts, but it sounds like this was a case of great premise and poor execution :( I hate it when authors skip points in time for no good reason also, and your edit about how it's forgettable just reinforces that I don't think this is one for me. Great review, though! I didn't think that much of this book. I thought it was a fast read but had a lot of problems with the characterization and world-building. I did like that we got some answers early on though. I LOVED THIS BOOK!! WHY isn't ANY ONE LOVING IT!! it is so good and i loved the romance the plot in it! is there going to be a 2nd book???? i am in love!